Kimberleys 2018: Day 2 -- Santiago, Chile. 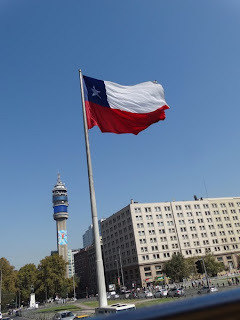 Day 2 -- Santiago, Chile. Today was planned as a rest day to recover from the flight. Well, I did sleep in till 9.30 am and just made it to breakfast before the dining room closed. The late start meant revising my plans for the day. t was a sunny and hot day, 35C at lunch. By 10 am the city was shrouded in smog, reducing visibility markedly and making photography difficult. (I've posted the best of what I took.). Decided to take the Turistik "hop on, hop off bus" to get a quick look at city and hear some of its history. Tourist tip: avoid the "hop on, hop off bus". At 22000 pesos (about $45) it is overpriced, and the 2 hour round trip takes 3 hours, a victim of the incredible traffic congestion here. Could have walked most of the route much faster than the bus. I reckon Santiago would give Beijing a run for its money on wall to wall traffic. But I did get a feel for the place. Originally it comprised a number of quite distinctive districts, and even still they maintain their own unique character. Now they have been absorbed into the urban sprawl that is Santiago. Lots of parks with beautifully kept flower gardens. And a very leafy city, with overhanging trees constantly scraping the bus roof. Hard to get good photos because of so many trees. I got off the bus at Bellavista (most had abandoned it a couple of stops earlier at the mammoth shopping plaza Parque Arauco). Took the ancient funicular up San Cristobel, the largest of the hills in the city. Wonderful views of the city from the top, although today could only see the nearer suburbs and downtown because of smog. A large 14m statue of the Virgin Mary crowns the hill. It is set in beautiful gardens with prayer stations and lots of pious music. Also on the hill is a lovely little Marian chapel, modelled on a 4th century Roman church. The inside walls have been carved by a German sculptor with scenes from the life of Mary, and give it a quite unusual appearance. Today the secularist city authorities have allowed large trees and phone towers to somewhat overshadow the statue so that it is no longer clearly seen from all over the city. Mind you, they haven't been able to eradicate the Catholic flavour of the place: I shopped in the "Minimarket della Santa Rosa di Lima" today for Kleenex. Having completed the bus circuit, I walked back to check out the Metropolitan Cathedral. In the square opposite I noticed a commotion going on, so wandered over for a sticky beak. There was a lady, just in her underwear, giving her best to 2, then 4, then 6 Caribenieri who were telling her she couldn't wash her clothes or herself in the fountain. She jumped right in, and the cops strategically withdrew to the applause of the very large crowd that had gathered to watch. The cathedral dates from 1790, and is a massive lump of masonry in the Spanish baroque style of the day. It is quite dark inside, with only the sanctuary area well lit. Lots of side altars with sundry saints bodies lying in glass enclosures. Every little shrine is well patronised, with fresh flowers placed there by devotees. I was impressed by the silence and devotion of the place, where even tourists are very discreet and respectful -- unusual! Of course there is an altar to St Santiago (St James the Greater) who is patron saint of Chile ( a relic of the Spanish colonial days). I haven't been too adventurous with food here. Last night I ate at a local restaurant and has a rich tomato soup and a beef dish with a beer, 39000 pesos. Tonight I settled on a Chinese menu in Spanish (it turned out to be chicken and mushrooms with spring rolls and Coke, 19000 pesos. Also, I noted that when I booked in at Brisbane airport my suitcase only weighed 18.5 kg. I knew I must have left something behind and today I discovered what: the small toilet roll I carry in backpack when out and about. Kleenex will have to substitute! I had forgotten what it is like to be on the go all day in a strange city, and by late afternoon I was footsore and quite weary. I trust I will get back into the swing of things as I travel on.